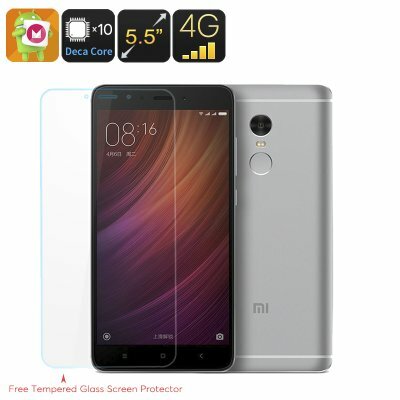 Successfully Added Xiaomi Redmi Note 4 16GB Smartphone - Deca Core CPU, 2GB RAM, 16GB Memeory, 4G, Fingerprint Sensor, 5.5 Inch FHD Display (Black) to your Shopping Cart. This 16GB version of the Xiaomi Redmi Note 4 drops a bit of memory for a more affordable price tag but still offers great quality processing and all the stylish looks and functions of the 64GB version. This 4th edition of the popular Xaiomi Note range delivers a reliable performance with its Deca-Core CPU, 2GB RAM and 5.5 inch full HD display. Brining flagship specs at affordable prices is a common format for Xiaomi and with the Note 4 they deliver a great value product again. The stylish design is borrow straight from big named brands and sees the Note 4 take on a glimmering appearance with its brushed metal body and curved 2.5D arced glass screen. Benefitting from a powerful Deca-Core CPU clocked at 2.1GHz and 2GB of RAM the Xiaomi Note 4 is more than capable of meeting all your daily phone needs. It can handle games galore and multimedia madness with a Mali T880 MP4 GPU to tackle complex graphics, which all look great on that full HD display. Step into a different flavor of Android as the Note 4 features Xiaomi's very own Miui 8 operating system. this combines all that is good from the latest Android OS with custom styling and features for a truly refreshing and intuitive interface that can be tailored to your needs. Xaiomi declares the screen is a real winner with a maximum brightness of 450nits, that would make it a shining start in the jewel of top features on this phone. Now you can enjoy that 5.5 inch full HD screen under any lighting conditions as the strong brightness can compensate for glare on sunny days. 4G is the order of the day when it comes to communication and with two SIM slots, the Redmi Note 4 can handle two numbers at once allowing you to easily organize and manage a hectic social and professional life all on the one device. What's more with lightening fast cellular data speeds downloading and streaming media or accessing online data is done without delay. A substantial 16GB of storage is waiting on the phones internal memory but should this not prove enough a micro SD card can bolster the memory with an extra 128GB of additional storage. This should prove adequate for even the most fanatical film buff or gamer as they can stock up with hours and hours of media to enjoy. The Redmi Note 4 Android smartphone comes with a 12 months warranty, brought to you by the leader in electronic devices as well as wholesale Android Phones and electronic gadgets..